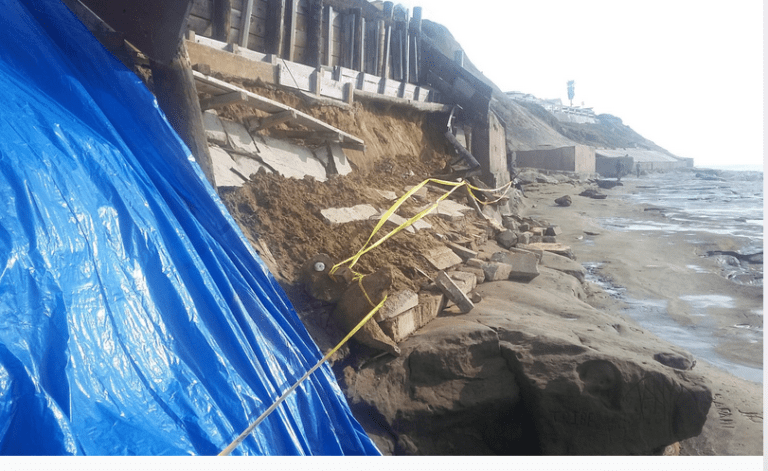 Sections of the bluff along Sunset Cliffs in Ocean Beach collapsed January 28th, right after heavy rains. First reported by Delinda Lombardo in the San Diego Reader, the collapse affected two properties, 5107 Narragansett Avenue – the Pelican Point apartment complex, and the property just to its south, 1783–1787 Ocean Front Street. Lombardo spoke to one of the residents of Pelican Point who told her that when he went to bed on Friday night – Jan. 27 – the bluff was all good, but, “When I woke up Saturday morning it was gone,” he said. After earth, large boulders, wood and debris fell on the rocks and sandstone, property owners covered the exposed cliff flank with blue tarps – which are still there. The lower passage way over the sandstone is now partially blocked by large boulders which makes walking through the area more difficult. But, of course, long-time residents can tell you about decades of eroding cliffs and of houses falling apart, and literally hanging over the edge. In fact, the house that the “father of OB,” Charlie Collier, built – the “Alligator House” – was lost to erosion and the cliffs. This is what cliffs do – they erode. The cliffs and the rocks around them have been changing all the time. And it is only hapless humans who attempt to stop this natural process. Some say the efforts to halt the gradual slides of dirt and rock only hasten or delay the inevitable. Back in the 1970’s as developers built large apartment buildings closer and closer to the edge, an energetic OB activist group tried to warn developers and the city. 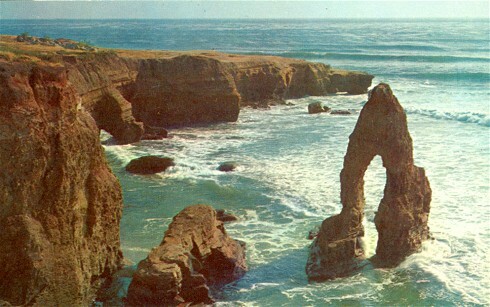 OB Ecology Action would stage pickets and protests to bring the community’s attention to what the developers were doing, warning all of the dangers of the naturally-eroding and beautiful Sunset Cliffs. Needle’s Eye – back when. Deep-seeded almost makes sense in a metaphorical way (though seeds sown too deeply won’t grow), but deep-seated is the term you’re looking for. The phrasal adjective (usually requiring a hyphen) simply indicates that something is seated (in the sense fixed firmly in place) deeply in something else. The OED defines it as having its seat far beneath the surface. So… will the homes 100 feet farther from the collapse fetch higher, or lower, prices now that they’re closer to the ocean? Will realtors be forced to advise potential buyers of the remaining homes that they may lose the land the homes sit on? Do insurance rates rise on the remaining homes? Maybe the president can build a wall?